Jokes is a collection of rib-tickling and hilarious short jokes and one liners in many categories like marriage, husband wife, doctor, PJ's and riddles. Warning! Be prepared to visit the doctor for a stomach ache which you will get by reading them. Enjoy the day going though this page that will take the stress of your daily tiresome life in this fast paced world. Humor is something which is a gift to mankind: imagine a life without humor, laughter or fun. If this page gives you 3 to 5 seconds of laughter and happiness, the author's purpose has been achieved. The author hopes you thoroughly enjoy every moment of your stay in this page and website. A man in a hotel: Waiter, there is a dead fly in my bean soup. Waiter: Oh, the hot soup must have killed it sir. Wife: Why do you wear your specs only when I come in. Husband: The doctor has ordered me to wear my specs whenever I get an headache. Student: Lower case 26 and Upper case 26. Customer in a hotel: Waiter, this soup tastes funny! Waiter: Oh!, the chef must have been laughing when he prepared it sir. Man 1: My son does not listen to anything that I say. Man 2: Is he so adamnant? Man 1: No, he is deaf. Two men were chatting in a bar. One says "Where are you from?". Second man replies "I come from somewhere where we do not end a sentence with a preposition". "Alright" says the first man, "Where are you from idiot?" Teacher: What is the first month? Teacher: What is the second month? Teacher: What is the tenth month? Girl: Mom, today the teacher beat me for something that I didn't do. Mother: That's very bad of your teacher. What was it that you didn't do? Wife to her husband: Wake up. Some thieves have broken into our house. I think they are now eating the food I made last night. Husband: Oh! Let's better call the ambulance then. An elderly married couple were walking in the park the other day and noticed a young man and woman sitting on a bench, kissing passionately. The wife asked, "Why don't you do like that man?" The husband replied, "I don't even know that woman!" Good resolutions are like beautiful girls: they are easy to make but hard to keep. Have you ever wondered why Tarzan never has a beard? Why do they always use sterilised needles when giving lethal injections? Husband: Do you know that John who lives next door has two girlfriends unknown to wife. Wife: Who is the other one? My wife complained the other day that our kitchen clock almost killed her mother. It fell seconds after where she had been sitting. That darned clock always was slow. Wife: The doctor has come to see you. Husband: Tell him that I am not feeling well and won't be able to see anyone. Patient to his friend: The nurse in this hospital is really wonderful. She touched me and my fever got cured immediately. Friend: Yeah, I could hear her touch your cheek in the next room. My brother is a terrible musician. The other day he asked my sister if she had heard his last recital. She replied: "I certainly hope so". Question: If you catch it, you will throw it away. If you don't catch it, you will keep it. What is it? "Dear Son, How are you? All are fine here. We miss you a lot. Please!! TURN OFF THE COMPUTER & COME DOWN FOR DINNER!!! Why shouldn't you hold a DVD upside down? Because the data might fall down. Santa to Banta: I don't have an internet connection at home. Can you please copy the internet on this pen drive for me? Question: Which day of the week is most hated by fish? Friend 2: I don't know. I wasn't with her when she was alone. My boss walked past my desk and asked me: "Why are you not working?" I replied "Because I never saw you coming Sir". Man 1: My son is not listening to anything I say. Girl 1: Oh I am doomed! That's my husband coming with my lover! Girl 2: I was about to say the same-thing too! Man to miser: Why do you always remove the batteries from the clock and keep them outside? Miser: I want to extend the battery life and hence I put them in the clock only when I want to see the time. Before going to sleep you can say Good Night. But before waking up can you say Good Morning? A young man was drving at 250 km/h on the motor way when a policeman stopped him. Driver:Sorry , officer, was i driving too fast? Officer:No,sir, you were flying too slow. What did the blond say after 5 years of work? She found out she was the only one not getting paid. what happens when you put a blond in a round room and tell her to sit in the corner? Are two people under the umbrella and one person is not but he is not mojado.Why?!? All were busy in writing except one SANTA. He wrote " DUE TO RAIN,NO MATCH"
A little girl walked up to a pregnant woman and pointed to her stomach and said what is that?" Lady :This is my sweet baby.I love him very much. The little girl :If you love him very much,why did you eat him? A Brunette runs to the living room and yells to a blonde "Hide there is a Serial Killer on the loose." The blonde says "oh No" and runs to the kitchen. the brunette follows her saying "what are you doing?" The blonde replies "hiding my Cheerios." Oh my goodness, the "Are you smarter than a 5th grader" comment is so true. 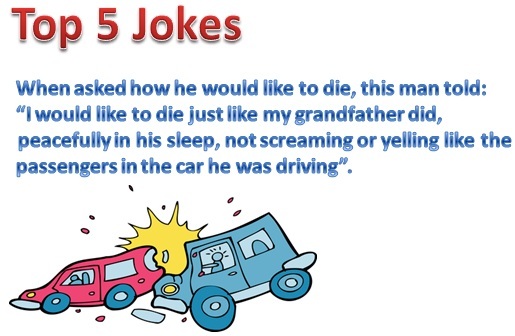 Almost ALL of the jokes have misspelled words, incorrect grammar or just make no sense. This is why they say education is the most important thing you can possibly have. Dumbasses. bartender: whats wrong with you? Kovila vida Schoola than neraiya Figure" varum..? ?